An American astronaut and two Russian cosmonauts will return to Earth tonight aboard a Soyuz space capsule tonight (March 10) after more than five months in orbit, and you can watch their landing live online. Returning home on the Soyuz spacecraft will be NASA astronaut Mike Hopkins and cosmonauts Oleg Kotov and Sergey Ryazanskiy, who are wrapping up a 166-day mission to the International Space Station. The trio is expected to land at 11:24 p.m. EDT (0324 GMT) on the Central Asian steppes of Kazakhstan, southeast of Dzhezkazgan. The local time at the landing site will be 9:24 a.m. on Tuesday. You can watch the Soyuz landing live on Space.com, courtesy of NASA. The NASA TV coverage will be broadcast in phases. 4:30 p.m. EDT/2030 GMT:Webcast begins for crew farewells and Soyuz/Station hatch closures. Hatch closure time: 4:45 p.m. EDT/2045 GMT. 7:45 p.m. EDT/2345 GMT:Webcast begins for Soyuz undocking coverage. Undocking time set for 8:02 p.m. EDT/00002 GMT. 10:15 p.m. EDT/0215 GMT: Landing webcast coverage begins. Landing time: 11:24 p.m. EDT/0324 GMT. Hopkins, Kotov and Ryazanskiy formed half of the space station's six-man Expedition 38 mission crew, which Kotov commanded. They launched to the station on Sept. 26 and joined the then Expedition 37 crew and stayed on to form the Expedition 38 crew in November. During their mission, Hopkins and his crewmates conducted a wealth of space experiments for scientists on Earth, and performed a series of Russian and U.S. spacewalks — including two emergency spacewalks by Hopkins and fellow NASA astronaut Rick Mastracchio to repair the space station's vital cooling system. They were the first spacewalks for Hopkins, who is also completing the first spaceflight of his NASA career. In January, the station crew also watched over the arrival of the first commercial Cygnus cargo delivery flight to the station by Orbital Sciences Corp. The Dulles, Va.-based Orbital has a $1.9 billion contract with NASA for eight unmanned Cygnus resupply missions to the station. The next Orbital flight to the outpost is slated to launch in May on the company's Antares rocket. While in space, Hopkins took amazing photos of Earth from orbit, as well as continued his "Train Like an Astronaut" project to encourage exercise for a healthy lifestyle. 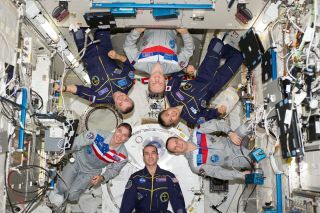 The return of Hopkins and his crewmates to Earth kicks off a busy few weeks of trips to and from the space station. On Sunday (March 16), the private U.S. spaceflight company SpaceX will launch its third commercial Dragon cargo mission to the International Space Station using its Falcon 9 rocket. SpaceX has a $1.6 billion contract for at least 12 unmanned Dragon resupply flights to the station. On March 25, three new crewmembers for the space station will launch aboard another Russian Soyuz spacecraft. NASA astronaut Steve Swanson will launch to the station alongside Russian cosmonauts Alexander Skvortsov and Oleg Artemyev. Swanson, Skvortsov and Artemyev will join NASA's Mastracchio, Russian cosmonaut Mikhail Tyurin and Japanese astronaut Koichi Wakata to complete the station's Expedition 39 crew. The station's Expedition 39 mission is led by Wakata, who became the first Japanese commander of the International Space Station on Sunday (March 9) during a change-of-command ceremony.